Background: Prevalence of cardiovascular diseases are reported to be high in police force, which constitute a special occupational group. “Partners in Prevention” was a special surveillance activity carried out among the personnel of the Department of Police, Government of Puducherry by JIPMER, Puducherry. The present study reports the prevalence of metabolic syndrome and other cardiovascular risk factors in this group. Materials and Methods: The design was cross-sectional analytical study covering 1618 policemen during 2013–15. A pre-tested questionnaire was used for collecting data. Anthropometric and biochemical measurements were carried out using standard techniques. Metabolic syndrome was diagnosed using the International Diabetes Federation (IDF) consensus worldwide definition. Statistical analysis was performed using the IBM- SPSS 21 software. Results: The mean (SD) age of the participants was 45.7 (10.1) years. Majority (90%) of the participants were males and were in the age group of 30–59 years. Metabolic syndrome was observed in two-fifth (42%) of the study population. We found the prevalence as: hypertension (45.2%), abnormal HDL levels (62.3%), diabetes (34.7.1%), and high body mass index of >=25 kg/m2 (60.5%). Conclusion: Our study identified that police personnel were having high CVDs and risk factors. It calls for an urgent need to initiate screening and secondary prevention programmes. Worldwide, there has been a surge in the prevalence of non-communicable diseases (NCDs); which have a multi-factorial causation. An individual's occupation and the workplace environment are known to be factors, which play a part in the development of NCDs. This understanding is the basis of the concept of a “healthy work place,” one which is not only free of physical hazards but also provides a healthy psychosocial environment for the employee to work in. A high prevalence of risk factors implies an increased cardiovascular morbidity and mortality in this occupational group, as has been reported in a study from the United States. Therefore, it becomes imperative to implement health promoting workplace programs as a means for reducing their cardiovascular risk as well as to create a healthy workforce. Since these personnel are required to maintain a level of physical fitness in order to perform their duties, they are more likely to be amenable to such initiatives than other occupational groups. Such initiatives can be planned in coordination with tertiary care hospitals, which have the infrastructure required for initiating preventive and promotional activities. “Partners in Prevention” is one such initiative started by JIPMER, a tertiary care hospital and the Department of Police, in Puducherry among police personnel in 2013. To assess the burden of risk factors in this group, an initial screening for NCDs and its risk factors was carried out. This information will help in identifying the priority areas which the program should focus on and also guide the designing of interventions to address the risk factors. This study was conducted among the personnel serving under the Department of Police Puducherry during 2013–2015. The results of the initial assessment of these employees conducted as part of the “Partners in Prevention Program” are presented in this paper. “Partners in Prevention Program” was launched in March 2013, launched by JIPMER in collaboration with the Government of Puducherry, with the intention of screening the employees in the above-mentioned forces for risk factors of NCDs and to provide appropriate preventive or curative services to the participants. At the clinics, the socio-demographic details of the participants, risk factors like alcohol or tobacco use and history of NCDs was recorded by a standard proforma. This was followed by anthropometry, blood pressure measurement, and biochemical investigations. Blood pressure was measured using digital manometer and two readings were recorded 5 minutes apart. The second reading was taken as the final reading. Appropriate referral was made to various specialty and super specialty department for personnel with abnormal values in tests or during examination. Height, weight, and waist measurements were recorded. Waist circumference was measured in centimeters placing the tape on the navel after loosening the outer garments. Body mass index (BMI) was later calculated. Venous blood samples were collected after a minimum of 8 hours of overnight fasting. Plasma glucose was estimated using glucose oxidase method. Fasting serum sample was used for estimation of lipids including total cholesterol, triglycerides and high-density lipoprotein cholesterol (HDL-C). Diagnosis of diabetes was made on the basis of American Diabetes Association (ADA) definition for diagnosis of diabetes. Diagnosis of hypertension was made as per the seventh Joint National Committee Prevention, Detection, Evaluation, and Treatment of High Blood Pressure (JNC-7) guidelines. Raised fasting plasma glucose ≥100 mg/dL, or previously diagnosed type 2 diabetes. A total of 1618 personnel participated in the study. The mean (SD) age of the participants was 45.7 (10.1) years. Majority (90%) of the participants were males and were between the age of 30 and 59 years. While one fifth of the participants had a history of smoking, nearly half (47.5%) of them had history of alcohol consumption. Almost half of the participants were obese based on BMI. 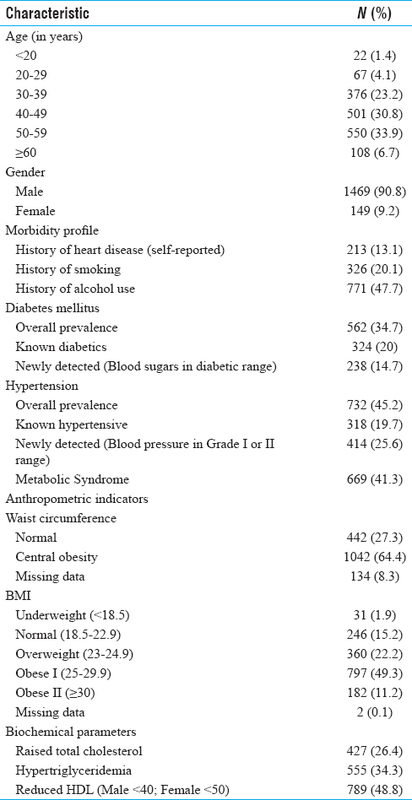 Metabolic syndrome was diagnosed in 669 (41.3%) of the subjects [Table 1]. Close to one fifth of the participants were known to have diabetes or hypertension [Table 1]. Among the 562 participants with diabetes, 238 (42.3%) were not aware of their diabetic status and were newly detected during the screening done in this study. More than half (56.5%) of the study subjects with high blood pressure, which were confirmed during their subsequent visits, were newly diagnosed. Among those who did not have history of hypertension, 618 (47.4%) and 299 (22.9%) participants were found to have blood pressure in the prehypertension and Grade I hypertension range, respectively. The fasting and postprandial blood sugars of 184 (14.4%) and 201 (15.7%) participants, respectively, were newly detected to be in the diabetic range during this study [Table 2]. Among 1305 participants who were not known to be hypertensive, screening could detect 414 individuals with blood pressure in hypertensive range. Therefore, the number needed to screen for hypertension was 3.1. Among 1280 participants who were not known to be diabetic, screening could detect 184 individuals and 201 individuals in diabetic range through fasting and 2-hour post prandial blood glucose measurement, respectively. Therefore, the number needed to screen for diabetes was 7 for fasting and 6.3 for postprandial estimation of blood glucose. Among the components which constitute metabolic syndrome (apart from central obesity), raised blood pressure or known hypertension was most prevalent as it was noted in 541 (81%) of the 669 participants with the syndrome [Figure 1]. This study carried out to screen personnel of the police force in Puducherry for NCDs; we found a high prevalence of risk factors like smoking, alcohol intake, obesity, and metabolic syndrome in this predominantly male population of workers. One fifth of them were known to have diabetes or hypertension. An additional 15% and 25% of the participants were found to be hypertensive or diabetic through this screening initiative. This study looked at behavioral risk factors like smoking and alcohol intake. The prevalence of smoking among the participants found in this study is similar to that reported among police personnel in other studies from India.,,,, Close to half of the participants reported alcohol use in this study, similar to that reported in another study among police force in Puducherry and Kerala., However, this was higher than that reported among police personnel in Vijayawada, Chennai, and West Bengal.,, Alcohol consumption is known to be high in the general population in Puducherry and Kerala, which could explain the high prevalence among participants of this study too. Since these are known risk factors for cardiovascular disease as well as other serious morbidities, it is essential to generate awareness among the police force about their ill effects and to provide services to help them quit these behaviors. Metabolic syndrome was diagnosed in close to 80% of the study participants which is higher than that reported in the other studies from Chennai, Kerala, and Puducherry.,, Metabolic syndrome reflects the derangements in physiological, biochemical, and anthropometric indicators, which are known to be precursors of cardiovascular morbidities. 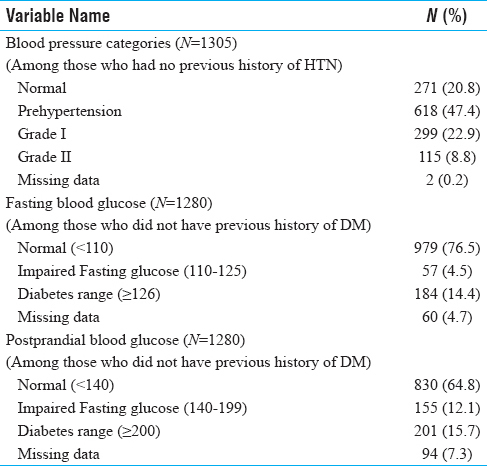 As seen in this study, the NNS for detecting new cases of diabetes and hypertension was very low. More than half of the hypertensive and 42% of the diabetics in this study were not aware of their condition and were diagnosed during the study. This may be due to a lack of awareness among the participants regarding need for screening for NCDs or work-related constraints, which may prevent them from getting screened. In this context, screening programs such as the one in this study, which are initiated by the employers, and can be conducted over a short duration of time for the entire workforce; become very relevant. The high prevalence of all the risk factors among the police workforce calls for special attention towards this occupational group through period screening programs and a detailed evaluation of factors like workplace stress, diet, and physical activity, which may contribute to these conditions. Periodic screening will help in detection of NCDs and their risk factors. For instance, identification of individuals in pre-diabetic or pre-hypertensive stages provides us an opportunity to provide non-pharmacological management to prevent their progress to the disease state. This not only will decrease future complications but also avert the substantial costs associated with the lifelong treatment of NCDs. These programs can also be utilized as platforms for interaction with the workers and for creating awareness among them. Guidelines for screening of the police workforce should be included in the National Programme for Prevention and Control of Cancer, Diabetes, Cardiovascular Disease and Stroke (NPCDCS) so that it can be implemented nationwide. WHO | Preventing Noncommunicable Diseases in the Workplace through Diet and Physical Activity [Internet]. WHO. Available from: http://www.who.int/dietphysicalactivity/workplace/en/. [Last accessed on 2016 Feb 2]. WHO | Healthy workplaces: A WHO global model for action [Internet]. WHO. Available from: http://www.who.int/occupational_health/healthy_workplaces/en/. [Last accessed on 2016 Feb 2]. Yoo H. Assessment of contributors to the metabolic syndrome among law enforcement officers. 2011. Available from: http://lib.dr.iastate.edu/etd/11993/. [Last accessed on 2016 Feb 2]. Ramakrishnan J, Majgi SM, Premarajan KC, Lakshminarayanan S, Thangaraj S, Chinnakali P. High prevalence of cardiovascular risk factors among policemen in Puducherry, South India. J Cardiovasc Dis Res 2013;4:112-5. Thayyil J, Jayakrishnan TT, Raja M, Cherumanalil JM. Metabolic Syndrome and Other Cardiovascular Risk Factors Among Police Officers. North Am J Med Sci 2012;4:630-5. Win KN, Balalla NBP, Lwin MZ, Lai A. Noise-Induced Hearing Loss in the Police Force. Saf Health Work 2015;6:134-8. Ganesh KS, Naresh AGV, Bammigatti C. Prevalence and Risk Factors of Hypertension Among Male Police Personnel in Urban Puducherry, India. Kathmandu Univ Med J KUMJ 2014;12:242-6. Kumar P, Mallik D, Mukhopadhyay DK, Sinhababu A, Mahapatra BS, Chakrabarti P. Prevalence of diabetes mellitus, impaired fasting glucose, impaired glucose tolerance, and its correlates among police personnel in Bankura District of West Bengal. Indian J Public Health 2013;57:24-8. Datta G, Sen A, Das M, Basu S. Prevalence of hypertension and its associated risk factors among Kolkata-based policemen: A sociophysiological study. Int J Med Sci Public Health 2015;1. Abu-Aisha H, Elhassan EA, Khamis A, Abu-Elmaali A. Hypertension and obesity in police forces households in Khartoum. 2015. Available from: http://dspace.uofk.edu/handle/123456789/18101. [Last accessed on 2016 Feb 2]. Violanti JM, Vena JE, Petralia S. Mortality of a police cohort: 1950-1990. Am J Ind Med 1998;33:366-73. Association AD. 2. Classification and Diagnosis of Diabetes. Diabetes Care 2015;38(Supplement 1):S8-S16. Chobanian AV, Bakris GL, Black HR, Cushman WC, Green LA, Izzo JL, et al. Seventh Report of the Joint National Committee on Prevention, Detection, Evaluation, and Treatment of High Blood Pressure. Hypertension 2003;42:1206-52. IDF Worldwide Definition of the Metabolic Syndrome [Internet]. Int. Diabetes Fed. Available from: http://www.idf.org/metabolic-syndrome. [Last accessed on 2016 Feb 2]. Shapiro AE, Chakravorty R, Akande T, Lonnroth K, Golub JE. A systematic review of the number needed to screen to detect a case of active tuberculosis in different risk groups. World Health Organ [Internet] 2013. Available from: http://www.who.int/entity/tb/Review3NNS_case_active_TB_riskgroups.pdf?ua=1&ua=1. [Last accessed on 2016 Feb 2]. Jahnavi G, Patra SR, Chandrasekhar CH, Rao BN. Unmasking the health problems faced by the police personnel. Glob J Med Public Health [Internet] 2012. Available from: https://doaj.org. [Last accessed on 2016 Feb 2]. Tharkar S, Kumpatla S, Muthukumaran P, Viswanathan V. High prevalence of metabolic syndrome and cardiovascular risk among police personnel compared to general population in India. J Assoc Physicians India 2008;56:845-9.